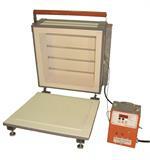 Home > KILNS > Glass Fusing Kilns > AF3P - 18-E 15"
We took this a time proven kiln that we have made since the 1970's and made it deeper! Comes with a 15" shelf and you can make up to a 10.5" square on it. Comes with a viewing window so you can watch your glass without having to open the lid. This kiln is top and side firing. It comes with the Orton Digital 3 -key controller, however you have the option to upgrade to the Orton Autofire 12-key controller or the TAP controller. It is pictured here with the Orton AutoFire 12-key controller upgrade. 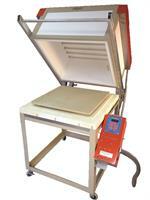 Kiln Model: AF3P - 18-E 15"